Amy Burgess always expected to perform in front of crowds. (She majored in theater at Miami University, after all.) She just didn’t plan on doing it in a 25-pound suit at Great American Ball Park. At the start of her 11th season with the Reds—and the team’s 150th anniversary—she looks back on what it’s like to be the one and only Rosie Red. And yes, it does get hot in there. “It literally just fell into my lap. I liked baseball and I saw an ad in the paper that they needed people to work with the Rally Pack: the people who shoot the T-shirts and stuff. I got hired with them and I was like, sweet, I’m making money performing and I get to do it at a baseball game. 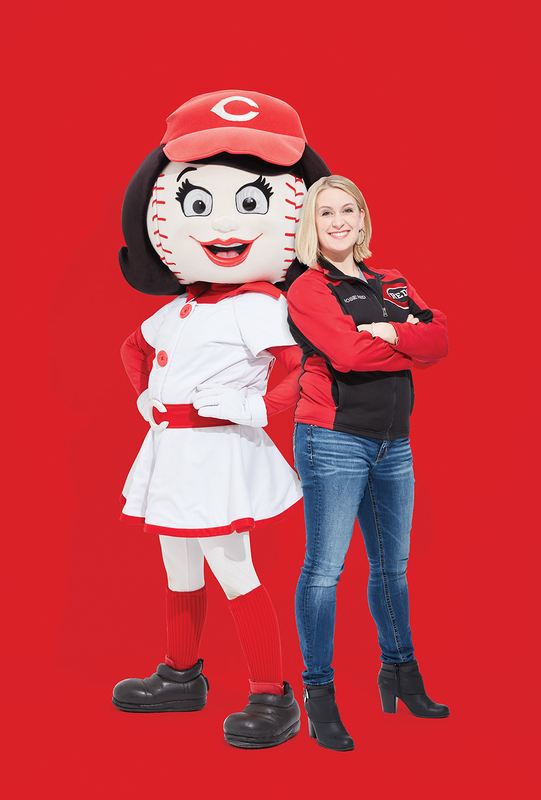 I started filling in for [Gapper] and Mr. Redlegs and then [the Reds] were like, We’re going to have a girl mascot. My interest was piqued primarily because it was something that would be mine. I would be able to originate a character and that really intrigued me. I stuck around to see what would happen and I ended up getting the suit and being the character and I haven’t looked back since. I like how feminine she is. Some people might say that she’s a characterization of females and a stereotype, but I like bringing some femininity to a predominately male sport. I like taking something that [women] can relate to in something that is so male dominated. It’s just a connection point for another audience. I’ve met a lot of people that I definitely wouldn’t have met had I not been in the suit. When we hosted the All-Star Game I met Snoop Dogg. He requested a picture with me. There’s really nothing more amazing than the kid that came to the game to see you. Their days are made because they got to see a mascot, and it makes my day knowing that all I had to do is give this kid a hug and their day is awesome. That’s a sweet job. I think [Rosie] throws herself into situations without appearing to have any sort of nervousness or trepidation in any situation. She’s very confident, and she sort of inserts herself socially into situations. I personally would not walk up to a group of strangers I do not know and try and start up a conversation with them as Amy, but Rosie seems to have no issues inserting herself into people’s everyday existence and lives. It is funny walking around seeing people wear things that have your character’s likeness on them. My husband has Rosie shirts. People buy him things because they’re like, oh, you’re married to her, you should have this. My kids all have Rosie stuff, we have bobble heads everywhere. My youngest [daughter], I don’t know if she associates it yet. She knows Rosie lives at our house, and she says out loud, ‘You wear Rosie, you put Rosie on.’ But I don’t think she really has processed it yet. I don’t think [my oldest daughter] realized until she was like 3, like ‘Oh my god, you are wearing Rosie; you’re inside of that thing.’ And it was at that point that her mind was blown. Their relationship with mascots is totally different than most kids their age because of that. It’s really hard working and making families or kids sad or upset because you didn’t stop for a picture or you didn’t make it to their seat or you had to leave before you could get a hug from this kid. I think some people think it’s a personal vendetta against them, and it’s like, no, I actually have someplace I have to be, or its 900 degrees and I just need a drink of water. It’s hard because you don’t want their experience at the ballpark to be, I got blown off by a mascot. I’ve rappelled off a building a couple of times and that was pretty crazy. It’s like, what am I doing right now? I’m literally in a mascot suit hanging off the Westin. I feel like I do more things as Rosie than I would ever do as Amy. I don’t have those kinds of guts as Amy, but I put the suit on and I’m like, oh, I’ll be fine. I meet people and then I forget that they didn’t meet me, I’ll go someplace and see someone, and I know them well as Rosie and I forget, oh my gosh you’ve never actually spoken to me as Amy. I have to remember, they didn’t meet me, I’ve met them. It is hot. It’s like conditioning; If you were going to run a marathon you aren’t going to be like, ok, 26 miles today. Let’s go. I always say if I didn’t work May-April-June I would never make it through July-August-September. It’s important to work the whole season because then you gradually build into the heat. The second most asked question is, Are you a girl?, or, Is that a dude in there? is really the more common phraseology. We have interns who walk around with me during the season, and every single one of them says, ‘I can’t believe how many people think you’re a dude,’ because literally every day someone is like, ‘That’s a dude.’ For a long time people used to be like, ‘Look at her claves, that’s totally a dude.’ I have man calves? OK. I did Redlegs and Gapper and not a single person ever asked me, ‘Is that a girl in there?’ Never once. I think what’s cool about working for the Reds is how woven the Reds are into the fabric of Cincinnati. We have other professional sports teams but for some reason baseball in Cincinnati is the thing that strikes the most nostalgia. Everybody has memory. Everybody has this part of the Reds that’s woven into their family somehow. And that’s cool to me because a lot of teams don’t have that. That first day is like, I always tell mascots from other cities, you don’t even get it. I respect your city, wherever you’re from, but you don’t get it. For that one day, everyone [in Cincinnati] is hopeful, everyone is nostalgic, everyone is excited about a new beginning. To me, that’s the most awesome feeling—to walk around the city and everybody is like, We’re not losing yet! It’s going to be awesome this year! People always assign relationships and you just sort of laugh at what they have concocted. Some kids will be like, that’s your grandpa, about Mr. Redlegs and then my husband is Mr. Red. Sometimes Mr. Red is my brother and Gapper is our dog. You never know what people are going to say and they come up with the strangest relationship justifications. There’s no defined relationship. We just let everyone make it up on their own. I just finished my 10th season, which is longer than I’ve been doing anything in my life. It’s longer than I’ve been married, it’s the longest job I’ve ever had. How did that happen? Ten years flies by.